Any Modern Family fans out there? If you happen to watch this show on ABC, you’re probably aware that one of the main characters, Jay Pritchett, owns a custom closet company, Pritchett’s Closets & Blinds. Jay’s worst enemy is Earl Chambers, who betrayed Jay 30 years ago when he started his own company, ‘Closets, Closets, Closets, Closets!’. As a custom closet and organization company, we often have customers ask if we watch the show, to which we always answer, of course! We can relate to a lot of those story lines, and really, who can resist a good rivalry paired with some closet humor. So, in honor of Pritchett’s Closets & Blinds and Closets, Closets, Closets, Closets!, we’re featuring some of our favorite closet organization projects, perhaps even projects Jay Pritchett and Earl Chambers would be proud to have completed! I t seems they are always running into difficult, yet hilarious, situations on Modern Family and here at Closets For Life, we also occasionally run into challenges but we never laugh them off! This particular project featured a very unique layout for which we needed a creative design solution. Our clients had purchased land with an old farmhouse and barn. Inspired by the original infrastructure, they built a new home styled like a barn with a silo addition attached in the location of the previous silo. 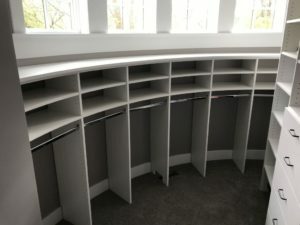 While we completed several custom organization projects within this stunningly unique home, including a master bedroom closet, a mudroom closet, a home office and a guest room closet, the project that posed the biggest design challenge was the two young girls’ bedroom closets. The girls’ rooms were located in the silo portion of the home which featured curved walls all around, including curved walls along the back wall of the closets. Visit our blog on this project to learn more details and see additional photos. We may be biased but we think this closet, with its warm romantic tones, Candlelight cabinetry with a walnut glaze finish, glass knobs, and Windsor crown molding, is beautiful enough to make a cameo on the Modern Family set. Featuring a unique floor plan and traffic flow, this was also our first project to win a COTY award back in 2011. We’ve since gone on to win an additional 5 COTY awards from NARI-MN. To see more photos of this stunning project, click here. 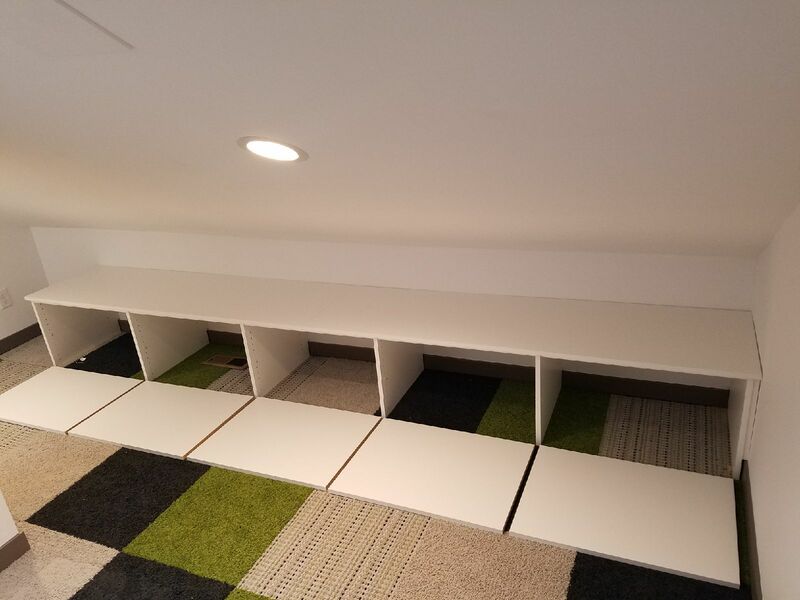 While this isn’t a closet, this multi-purpose room is our most popular project on both Houzz and Pinterest and it’s easy to see why. Beyond the beautiful cabinetry, as the only spare room in a 1,700 sq. 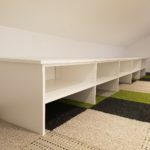 foot condo, our clients needed this room to serve multiple purposes; a home office, a guest bedroom, an exercise space and a space for grandchildren to play. 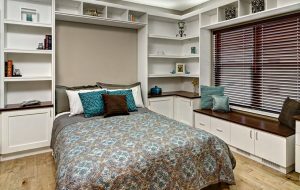 Featuring a Murphy Bed, built-in desk, ample shelving and cabinetry for storage, this project highlights how smart design and some creativity, can expand the versatility of a room without sacrificing aesthetics. 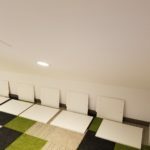 To see more photos of this project, visit our feature page highlighting the project. 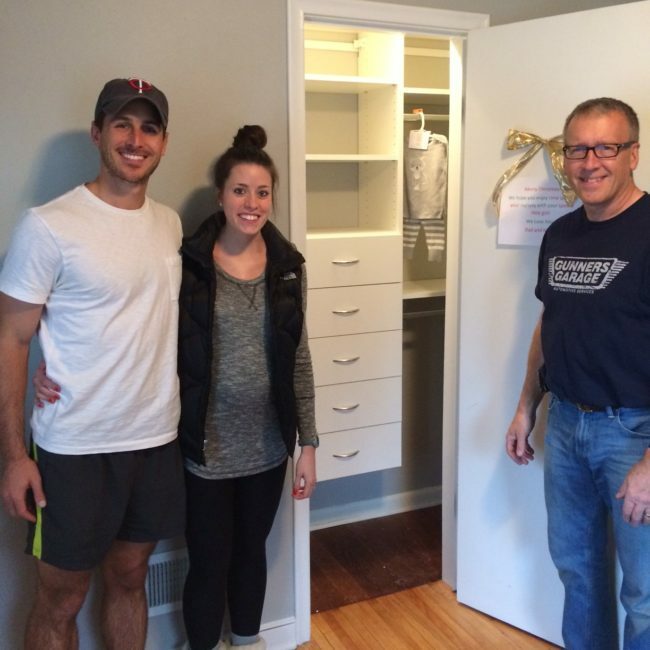 When Closets For Life owner, Rick Lyrek, found out he would be a Grandpa with the arrival of his first grandchild last March, his choice of gift for the parents-to-be was obvious, a new closet system for the baby’s room! 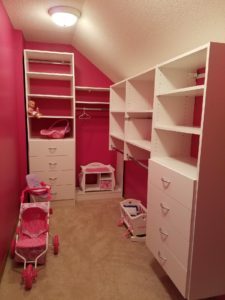 Living in an older home, the baby’s closet was very narrow and deep, making it difficult to view most of the closet contents. Also, with just a closet rod, the current closet didn’t offer many storage options, especially for mini-sized clothing! Looking for the perfect gift for a loved one, the parents of a new baby or a newly married couple? Consider gifting a custom closet organization system. It is a wonderful gift that will outlast even the reruns of Modern Family! Peruse our photo gallery for inspiration. 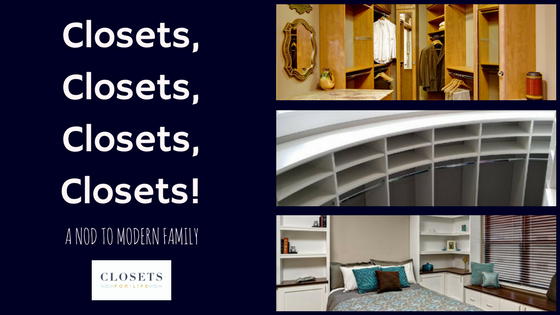 Whether you’re inspired by Modern Family or by our examples above, Closets For Life can help you be the star of your own custom closet. 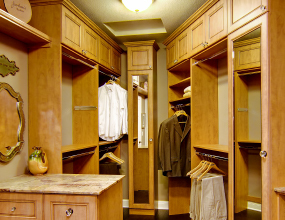 We design closet organization systems for all areas of the home, customizing our design to your needs and your space. Give us a call and have us out for a free in-home consultation. We can’t wait to show you what we can do for you! We recently completed two projects that brought us back to our younger days! 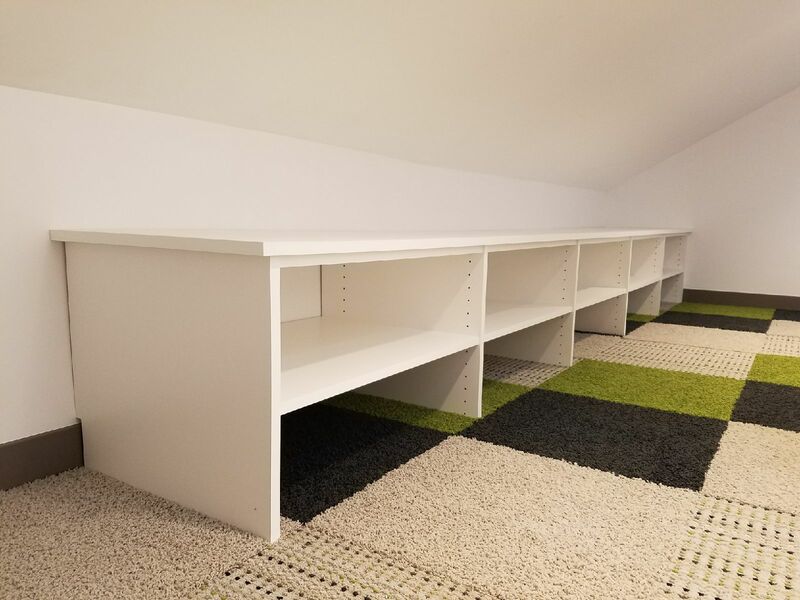 With the majority of our organization projects being related to the adult world (master bedrooms, garage organization, wine cellars, etc), it was a fun opportunity to complete not one, but two, children’s room projects in one week. 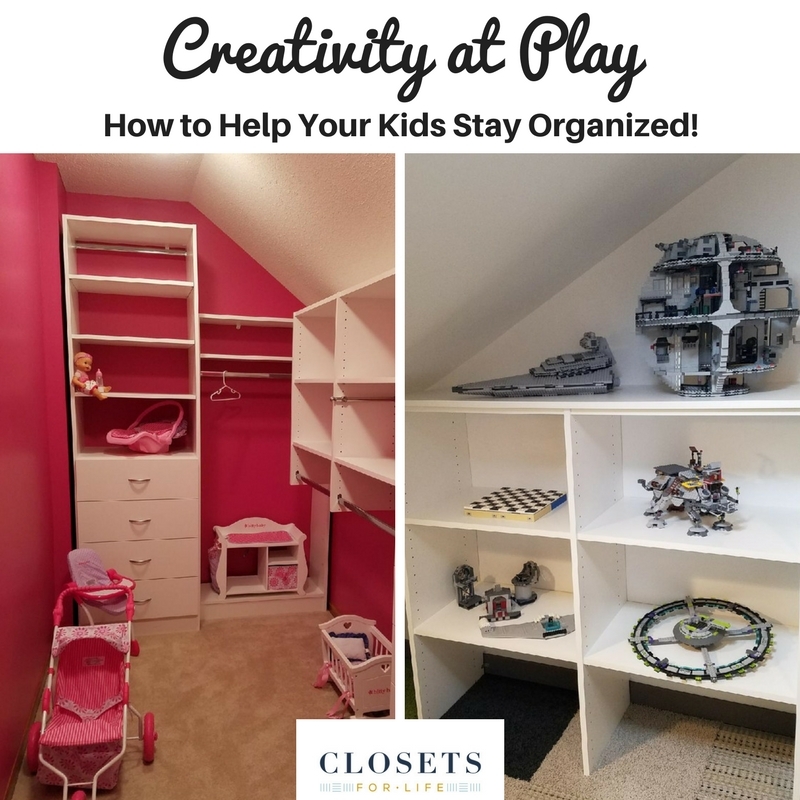 Custom organization can be a wonderful tool for helping kids keep their toys and clothes organized. Designed with features such as fixed and adjustable shelves, drawers and hanging bars, these systems can easily grow with your child, providing a return on investment for years to come. 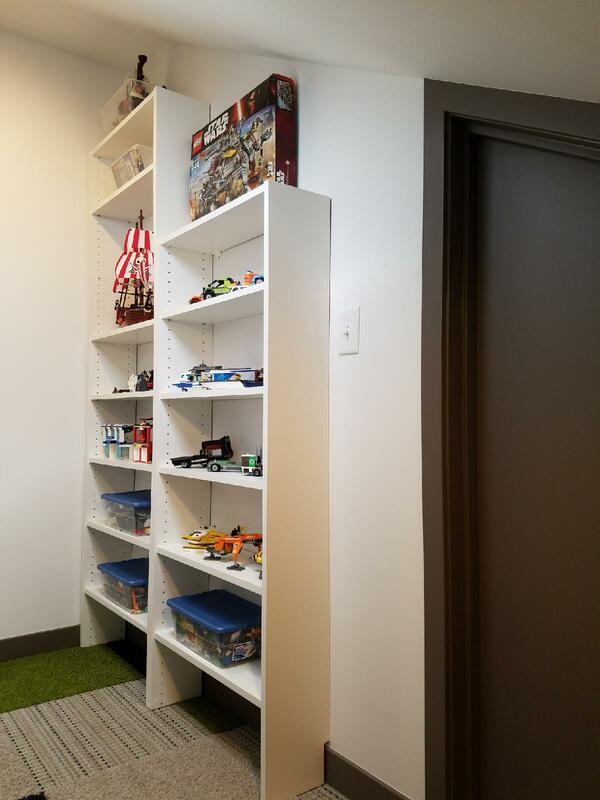 Whether your looking to organize your toys or clothing, we can help you design the perfect solution. Just look at these two projects! 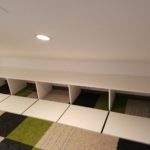 Our first children’s room project was a playroom organization project. 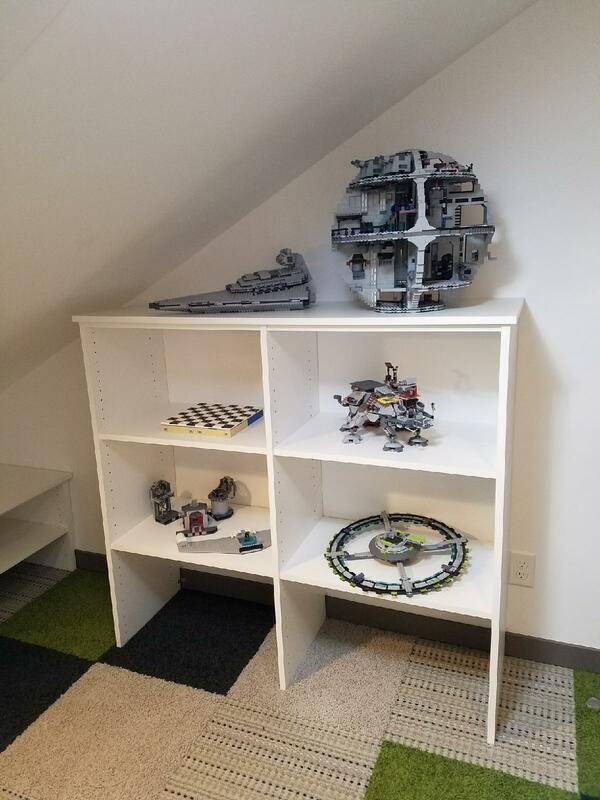 Our clients came to us with a playroom full of Legos. They wanted us to create a custom organization system that would provide space to both store and display an extensive Star Wars Lego collection. 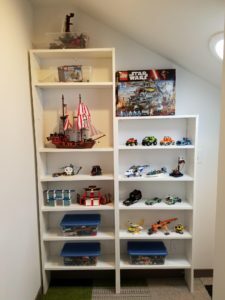 We created a design with multiple units to accommodate the varied slanted ceiling heights and plenty of open and flexible shelving to hold plastic storage containers and completed Lego sets. 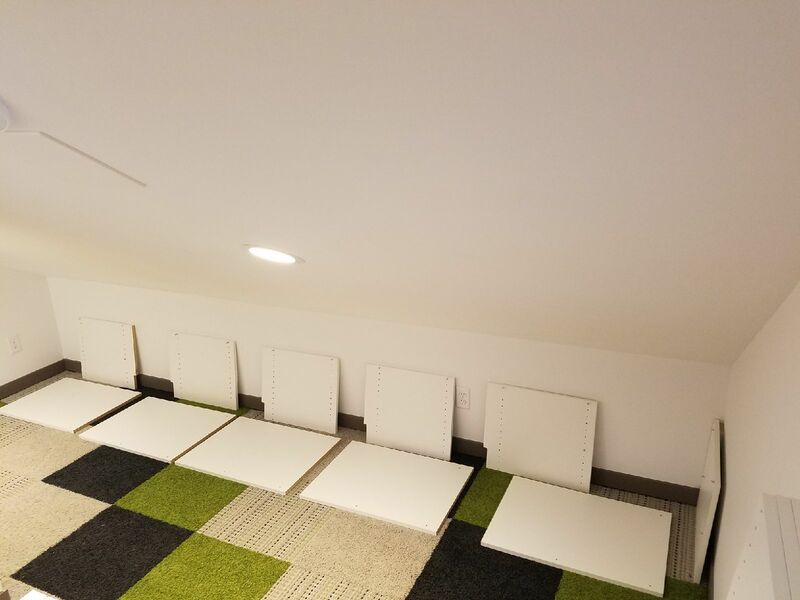 We suspect Corbin, our installer, had more than a bit of fun staging these photos. 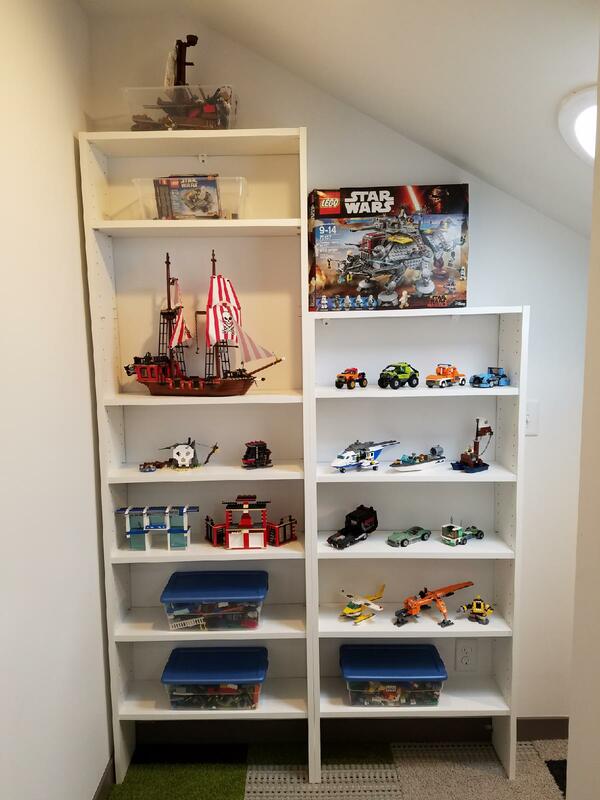 Although in his words, assembling custom storage systems is the adult version of building Legos so he gets to have fun everyday! 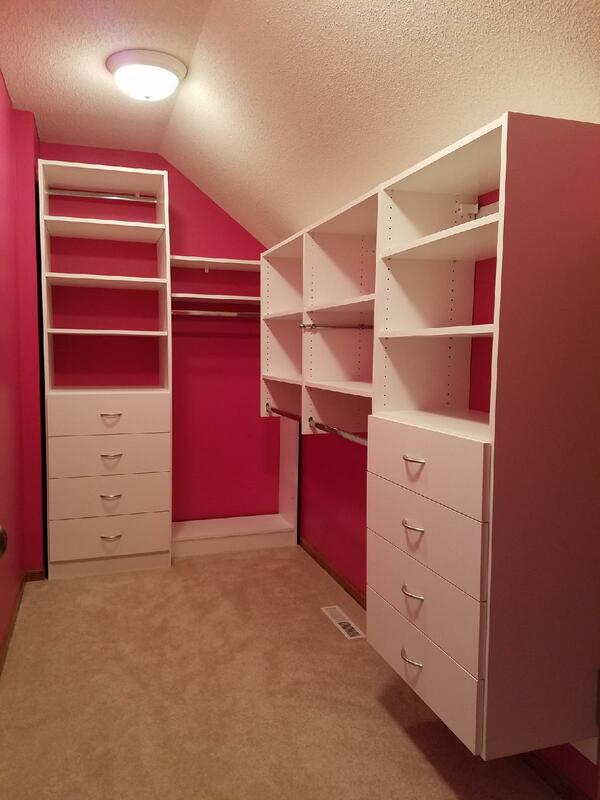 Our second project of the week was a custom closet system for a young girl’s room. 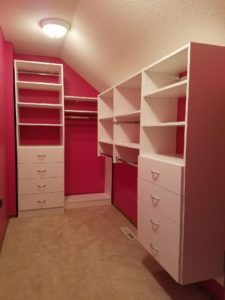 Needed for two purposes, to store American Girl items and for storage of the young girl’s clothes, we designed this custom closet with versatility in mind. Drawers, hanging bars at multiple heights and adjustable shelving provide ample storage for both toys and clothes and, as the the young girl grows, the system will easily grow with her. Mixing with the white cabinet finish, these bright pink walls perfectly set the American Girl theme! Give Closets For Life a call at 952-484-0416 for a free in-home consultation to see how we can help bring organization to your child’s playroom, closet or bedroom.